The backstory of how I've been invited to The Weather Channel 30 year reunion this weekend | Watts Up With That? No, I won’t be meeting Heidi Cullen. 30 years ago, on May 2nd, 1982, a new satellite channel debut made history. TWC went online thanks to the work of dozens of pioneering meteorologists and technicians, including my friends John Coleman and Joe D’Aleo. This is my personal story, never before told here. I was invited to the 30th reunion, which is being held this weekend, due to the fact that I myself was an early pioneer in weather technology for television, and TWC was one of my early customers using what was then some “revolutionary” technology I developed. Few people who read WUWT know this, but I developed the first ever interface to allow computer weather graphics done on the IBM-XT @4.77Mhz, and later the IBM-AT @ 6.0 Mhz, to be broadcast on television. This was no small feat, because back then, such devices were usually rack mounted dedicated boxes. 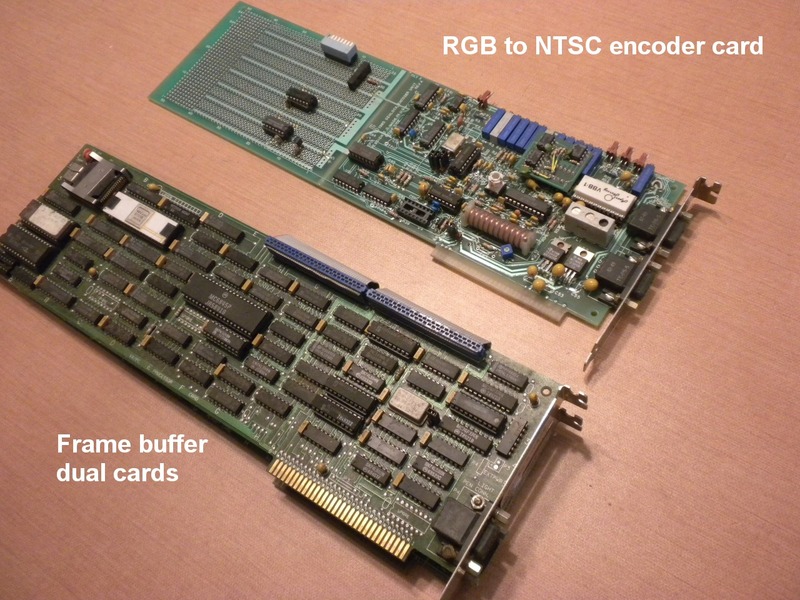 Using a dual slot frame buffer card from an early CAD/CAM terminal company called Vectrix, I designed the first ever PC based broadcast quality RGB to NTSC encoder card for the IBM-PC platform. The other half of the frame buffer card (not shown, underneath) is nothing more than rows and rows of 64K DIP memory chips. This ISA buss full length dual card was driven by an Intel 80188 CPU with a command set programmed to take ASCII commands (over a parallel or serial port) like [draw pixel, x,y] It was crude by today’s standards, but revolutionary then. Today, any cheap PC video card for $49 will run circles around what you see above. Notice the long white ceramic chip in the upper left of the frame buffer card. That’s the heart of the graphics engine, the NEC 7220 graphics display controller chip, one of the first graphic chips ever invented. It allowed us to do things never before done outside of mainframes and was designed to be the heart of this beast, the NEC APC Advanced Personal Computer. The trick to making the NEC7220 produce broadcastable RS170A (NTSC) video came with a mandatory need for something called “genlock“, which allowed all devices in a TV studio to be synchronized into a common switcher, so that video effects like green screen chroma key (essential to TWC) could be done. Making the NEC7220 do genlock, was no easy task, since it had never been designed to do that job, and had no sync input of any kind. The task was something I took up, because I wanted to open up the IBM-PC to the world of broadcasting. 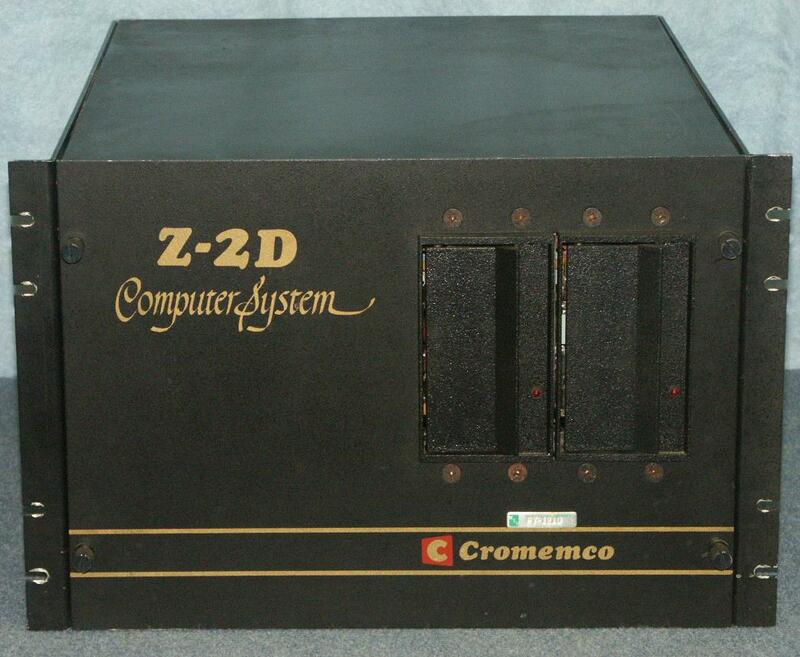 When TWC started, they were using Z80 CPU/S-100 buss based Cromemco Z2 rack mount beasts with a 16 color frame buffer card done with an external rack-mounted NTSC encoder. The price tag on these things with software, broadcast encoder, and training was easily $30,000. 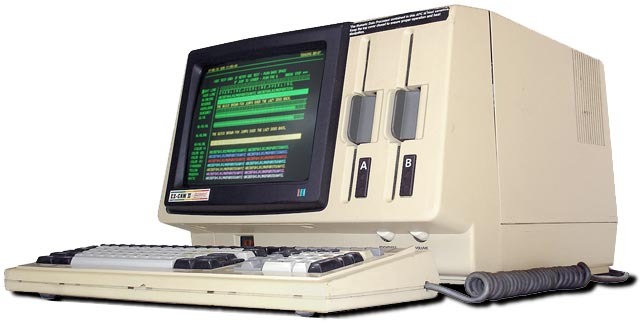 Cromemco (named for CROthers MEMorial Hall – the Stanford residence where the founders lived), came into existence in the mid 1970s, and grew to become a major player in the S-100 business systems market. Check out the dual 360K floppy drives whoo! More here. The Z2 was adopted by Terry Kelly of Weather Central in Wisconsin to broadcast some of the very first weather graphics supplied by WSI corporation. The did custom programming (in BASIC no less) to enable some of the very first weather graphics to be displayed on TV, prior to that, we had Alden Fax images and magnetic symbols on metal boards. I used such a setup in 1978 when I first started in TV and I salivated over computer graphics. One time I tried to adapt an early Apple IIc computer for use on TV and in 1979 I called up Apple and asked to speak to the “chief engineer” about the video output quality. It wasn’t until a few years later that I realized I had given Steve Wozniak himself an earful about video signal engineering. I still remember the sound of the little floppy drive after typing in PR#6 from the console to get it to read the disk. Note all the analog circuitry. There were delay lines (the big copper coiled tube is a 400 nanosecond delay line to match the 3.58 Mhz chroma subcarrier to the luminance signal) filters, scads of bypass caps to keep the noise down, plus subassembly chips and boards that were NTSC composite and RGB signal distribution amplifiers respectively. That plus a phase locked loop on the NE564 chip design that kept the clock of the VX384 frame buffer card in sync with studio gen-lock signals. It was analog black magic, all hand-made and hand-soldered. Tuning this card was not unlike trying to tune the SU carburetors on a British Leyland Jaguar V-12. I had 12 trimpots plus a trimcap that had to be adjusted “just right”. Setup was accomplished using a TV monitor, an oscilloscope, and several test points on the card and usually took about two hours to get right. In those days, component drift could be a problem, and if you didn’t get the card up to temperature in the chassis first, you could miss the sweet spot and you’d lose genlock…which is a disaster on air in chroma-key when the satellite picture behind the talent in front of the green screen would go wonky. Tech savvy readers might have noticed the “breadboard” area of the NTSC encoder board I designed. There was a reason for that, thanks to the Grass Valley Group corporation, whose GVG broadcast production switchers had nuances that required me to adjust the blanking signal in the RS170A output in order to get properly horizontally phased gen-lock at some TV studios. So, I’d often have to add a switched delay line, and that breadboard section allowed me to do that on-site if need be. Yes, I’d tweak these systems onsite with a portable oscilloscope, wire wrap, a soldering pencil, and my wits. Both WSI corporation and Accu-Weather used weather display systems I designed for them in the 80’s and 90’s. That little NTSC broadcast encoder board enabled hundreds of TV stations to put weather graphics on the air. So, enough about the technology. The point is that John Coleman and Joe D’Aleo, who made TWC happen, thought my contribution to early TV weather and TWC was significant enough that they invited me to attend, even though I was never on the air at TWC, though back then it was a dream I had. I thank them for the gracious invitation. I’ll be attending the TWC 30 year reunion this weekend, and reporting on this once and only event here at WUWT becuase I feel it is important to document this unique piece of American history. I’ll be traveling to Atlanta tomorrow, for the meeting Saturday. Blogging will be light the next couple of days. I generally don’t like to beg, but all of the travel and lodging is out of pocket, and my “big oil” check still isn’t in the mail, so if anyone feels like hitting the tip jar (orange “donate” button) on the right sidebar, I will be most grateful. If anyone has any questions about how TWC got started and operated they’d like me to ask while I’m there, feel free to leave a comment. Antony, I’m very impressed. I’m an electronic engineer specialising in FPGA design (digital) and that analogue stuff looks well scary! Did you have an electronics background? Donated, good luck on your trip, I’m glad to see your contributions are being recognized. It was fun exploring the technology 30+ years ago. I never did much more complicated than build my own joystick from microswiches, interface it to an Ohio Scientific single board microcomputer (with 4K of memory and cassette tape I/O! ), and write a Pong knockoff. A little later it was interfacing IBM-PCs with a 370 mainframe through IRMA boards to upload data from floppy disks. Have a great time at the reunion. Feeble donation made under my real name. Keep up the good work. I can fix that” and he took it home for a weekend. When he brought it back he reported a crack in a circuit board that he soldered over. We had a mutual friend Bob Dale at Purdue, who was a former California State Climatologist. Anthony never lost a chance to be a better scientist with his weather broadcasting. Anthony is still a major player in weather broadcasting in the US. As a scientist Anthony has wanted to present weather with better understanding. His concern with the paint on thermometer shelters started a grand inquiry. Anthony’s investigation of temperature station exposure was nation wide in scope and growing. From each according to his ability is the example what Anthony lives by. Anthony serves the community to the best of his ability and has been an inspiration. Energy conservation has been another of his concerns by advocating solar power. Anthony’s hearing disability may have factored in ending his live television time. Perfection is reserved for the Creator, we mortals have our faults. Public service has been Anthony’s example for all of us. Jim Goodridge, thank you most sincerely. SU “Carburettors”….ugh. Had them on an old Volvo 145 wagon. Heaven help you if your air filter was dirty. But the best SU story was in Khartoum, Sudan, in 1996 (when Osama lived there)…when I came upon a couple of Sudanese trying to revive their old Mercedes-Benz 240 by Pifffing mouthfuls of gasoline down the throttle body. At one point they removed the vacuum cup from the needle valve, and it was basically gummed up with red dust….as they had been driving it without an air filter. I suggested they piff a bit of gasoline on the SU guts to clean them up (seeing how they were accustomed to piffing gasoline). Not something one would recommend under normal OSHA conditions, but this was Sudan in 1996. Good thing they never got an intake manifold backfire. About the same time I worked on mixed analogue and digital electronics like this to fly a 500kg warhead to its target.Videos and microwave stuff all in one box. I work in microwave stuff. The thing still works and is still sold with modifications to allow for 8085’s that are no longer available. What’s a pixel? I recall the video coming out of an Apple II C and E being NTSC (Never the same color twice), but what would you expect from a NE556 timer as the sync gen. Then there was the addition in the Apple III ‘convolutions’ to try and fill in the retrace so it would look solid. All it did was give you a nasty headache because of the flicker. Looking at your boards sure brought back some memories of what Engineering was really like. So the 64K DRAM was it 12 volt? Wow. What a blast from the past. We are very old my friend, very old indeed. I actually remember working on most of the hardware you have pictured above. At least we aren’t so old we can’t remember it! Cheers and have a great time. Ahh, that was a trip down memory lane. . . and the wife (a TV engineer) told me the Death Star’s “secret” re GVG almost 20 years ago now. Enjoy your trip –a couple drinks on me (via the tip jar). That’s quality stuff right there. I started on a Targa 24 system in 1989, but it likely had very similar boards installed. 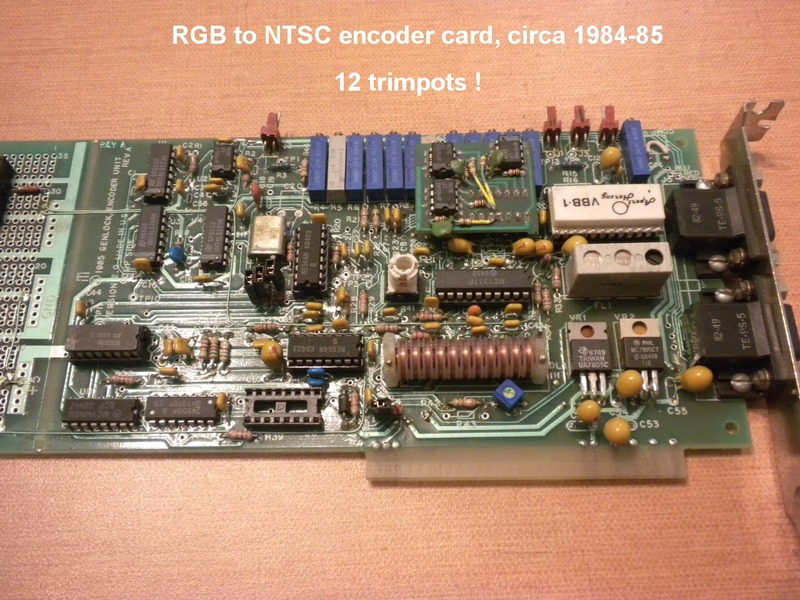 The input and output boards failed around 1991, so I started using outboard RGB encoder and decoder with that system. It was a fun time to learn digital video graphics, and was the first time I got to “alter reality” with a graphics workstation. Thanks for the fun reminder! I joined the BBC in the mid seventies and remember being taken for a ‘tour’ of a NTSC to PAL standards converter. This consisted of several full-size racks. Today it all fits on a part of one chip. I still remember genlock, natlock, rubylock etc. and the time spent making sure everything was in phase before transmission. I was a big fan of The Weather Channel until around 2008 or 2009. The channel has become increaslingly slick and too much 30 minute programs. Al Roker makes me want to puke also. I’m not sure what happend, but the programming just changed a few years ago. straight from the test-stand data, (and right away too!!!). the first micro-computer anybody then had ever seen. All those rugged engineers loved that heavy black box. “Oops, our mistake, why don’t you just keep them? since the new ones have twice the capacity. Just seeing the picture was a jolt to dormant memories. As one who started work as a electronics design engineer in 1975, I say bravo and congratulations Anthony. Great stuff! You rarely ask for money. Glad to help one so very deserving. Did Wozniak doing anything in response to your giving him an earful on Apple graphics? Anthony Do have a background in Electrical engineering as well as meteorology ? How did you get involved in the electronics? Just wondering. I’d entirely forgotten those Cromemco things. I’d built some audio hardware and software for them in the realm of speech research…. much less complex and much less useful than yours! I’m obviously a bit older than you – I got my degree in Civil & Structural Engineering with nothing more high tech than a slide rule. They taught us a bit of Fortran but I never even got to see a Computer at University! But I couldn’t do this kind of computer wizardry myself, even today. However, I’m reasonably nifty with Excel, which is more than Phil Jones can say. But, of course, he’s a “Great Scientist” whilst we are nasty “Anti-Science Deniers”. It looks like I have something else to thank you for besides what this site normally deals with. You mean … you’re not paid by big oil? I’m not. Who is? A small donation to a big man. They say a change is as good as a rest. Since you hardly ever seem to rest, enjoy the change! Jim Goodridge mentioned Watts having hearing disability? I goggled and I see that Watts has 85% hearing loss. Interesting. I also have hearing disability, about 99.9% hearing loss when I got really sick with meningitis at the age of 20 months old. Nice backstory . . . .
You have provided a hallowed forum for balanced education. There can be no words sufficient to show enough appreciation for your forum. I will see you at ICCC-7 . . . . I hope you enjoy your trip as much as I enjoy WUWT – an island of sanity in a storm tossed sea. BTW, my contribution comes from my recent BIG OIL check…OH CRAP! Upon further review, that was actually my gas bill! Glad to contribute Anthony. You’ve contributed so much to my continuing education. Have a great time! I spend the 70s and 80s as a test engineer testing mainly DRAMs but also 74 series TTL logic. We used Fairchild Xincom for memory and Fairchild Sentry VII for logic. We started with 1103 1K DRAM, moving through 4K, 16K then 64K. After 64K the need for incoming test (which I was) on DRAM dropped away but by that time Custom VLSI was coming along and that meant another 10 years work. Anthony, thanks for the enjoyable trip down memory lane. One of the first things that jumped out at me in the image of your NTSC to RGB encoder were the three “almost” devices on the subassembly board over the trimpots (the three resistors bridging across circuit traces). We used to call them “almost” devices because they were hand soldered to fix a circuit design that almost worked without them. It was rare to see a board in that era that didn’t have at least a few. An impressive design by the way. The proto section of the board was very much a product of thinking ahead. I’ve been a long time reader of this blog (and thank you for that) but really haven’t taken the opportunity to post before. This time I can’t help myself. You really engineered those boards? Wow, I’m impressed. And thank you for the trip down memory lane. I was a much younger Engineer with GVG at that time. I didn’t work on the Model 100 but those guys were in the cubicles right across the aisle. 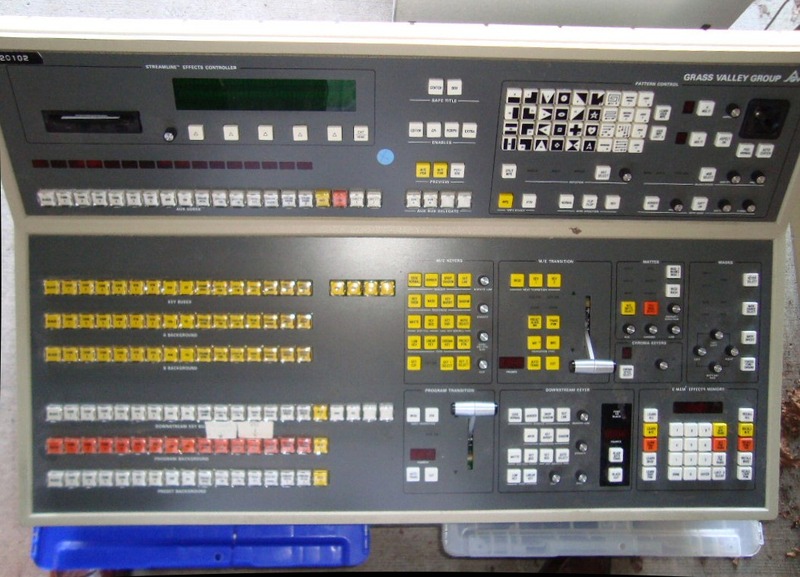 Since you come from the Broadcast Industry you may remember the GVG Kaleidoscope Digital Picture Manipulator (AKA DVE). That was my baby, I was on the K’Scope development team at the time. This was an exciting era in the television industry as technology was moving from analog to digital. At that time we necessarily had a mixture both technologies to make things work – along with all of the fun calibration and tuning exercises you speak of. And those old computers – what a hoot! Our project had two IBM PCs (with gigantic 10MB hard drives) with schematic capture software shared by 6 or 7 engineers all trying to draw up our designs during our assigned time slots (the SW cost more than those ‘hot-rodded’ computers so the company wouldn’t spring for many). But hey, all of the other guys were drawing with pencils on Vellum. Thanks for the the trip down memory lane – but geez it doesn’t seem like 30 years ago! I’m still up in your neck of the woods in Nevada City although not with GVG any more. I’m enjoying life as an independent Engineering Consultant serving not only my Alma Mater but also its many spin off children up here in ‘Video Valley’. 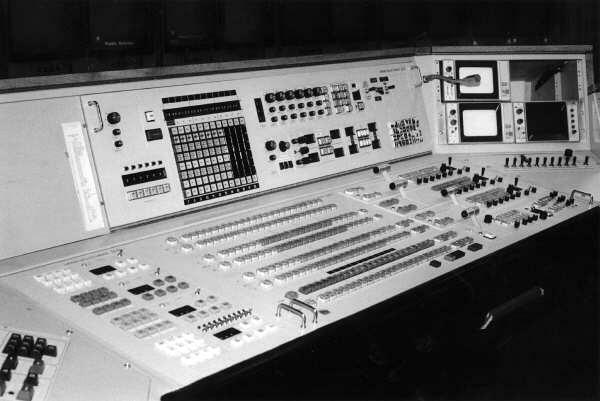 BTW – the switcher in original Star Wars film was a GVG Model 1600 which was state of the art in the mid to late 1970’s. We all got a huge kick out of seeing it in the theater when the movie came out. The control panel had no circuit boards. All of the buttons, lamps, switches and knobs were hand soldered into a massive wire harness going to a bunch of 100 pin mass connectors. Extremely labor intensive to build and beautiful to look at when you propped up the lid. The wiring harnesses always reminded me of those anatomical drawings of the whole body blood circulatory system with veins and arteries merging, branching and connecting to everything. The Model 200 shown in your picture is about two generations more modern (and much more capable, stable and cheaper to manufacture). Thanks again for making me feel younger! to enable some of the very first weather graphics to be displayed on TV, prior to that, we had Alden Fax images and magnetic symbols on metal boards. In the 70s I remember one local station that had magnetic High and Low pressure symbols that had rotating discs behind the H and L.
I’m not sure if I knew Anthony was a ham. N5TFK here, Been licensed since 1992.
the only donate button I see, is dedicated to keeping the surfacestation project going. Is that the one for your trip? Being that I own a 0.0010 working interest in 13 (going on 15) oil wells in South Texas, I will generously bestow $30 bucks on you so that you can honestly say you are “big oil” funded. I am big oil. Ha. I hated those SU carbs. I had them on my MG. Years later, the first thing I did when I bought my Harley was replace the SU carb the previous owner had installed (because it was so nice looking) with an S&S. I suspect that most climate “scientists” wouldn’t know which end of a soldering iron to hold (ouch!). Glad to help, Anthony. Cheers. Through hole components, 8 inch floppy disks, 64K Ram and no hard disk. 30 minutes to compile a stupid PL/M program to find out you missed a semi-colon. See what you whippersnappers missed? If the EPA continues it’s war on technology, we won’t even have that. First time I made a donation. Guess I’m a newbee. Easier to do than I thought. Once a pay up my credit card next week I’ll make a bigger one. You see my credit card’s always maxed-out. Thanks for the excellent site and all the info. BTW: Get rid of those SU carbs and get proper Webers. Anthony, this can’t be true. Those guys on other sites keep telling me all you are is a weather reader. I am nowhere in the same league as Anthony, but when I was a young lad in the British army in the 70’s I used to have to calibrate and maintain half ton mechanical computers, that were used to aim 40 mm anti aircraft guns. When I heard that the yanks were building silicon chips to do the same thing, I was offered the chance to go over and get in on the ground floor. ‘No chance, it’ll never take off’ I said. Donation on the way; enjoy the trip! Have a good trip and blog about it as time permits! When I was a field engineer for Chyron, I used install them at TV stations and teach the operators how to use them. It was ALWAYS the weather folks that asked the most intelligent questions and had the most vision on how to use grapics. Have fun, Anthony! Tip Sent. Did you invent the ‘green screen’ that weather people use? And I’ve fiddled with some of those beasts a couple years after 1982. I always wondered why the weather graphics were so much advanced over our IBM PC with it’s 10MB hard drive add on unit. Nor did our XT or Compaq clamshell change anything. The technology is way beyond me–even 30 year later– but what I got out of this is that Anthony was nerdy when nerdy wasn’t cool. A small ka-ching for your accomplishments and your invitation to the reunion. Well Done Anthony you deserve recognition. We in the UK considered a Weather Channel as a most odd American quirky thing when it first started. Which is odd as we are weather addicts. Dear mod, if you had watched the Whittle video you would have found that it was about Steve Zwick’s love of AGW theory and not Krugman. He made a contribution by being the funding bill sponsor. That takes some leap of faith and imagination that many politicians don’t have. He got lucky and it was a huge government funded success. Get over it. And stick to the topic instead of trying to hijack it. Just stick with Anthony’s achievements in pioneering weather overlays. Through hole components, 8 inch floppy disks, 64K Ram and no hard disk. 30 minutes to compile a stupid PL/M program to find out you missed a semi-colon. See what you whippersnappers missed? Thanks for a trip down memory lane. At one time you could look at circuit boards and tell what they did. Hardly now. Our generation invented the digital world. Anthony, we obviously have more than I thought in common. However, my electronic engineering design career, dating from 1963, is only backed up by my weather forecasting experience as an ocean sailor. (When you are hundreds or thousands of miles from shore, weather becomes a very important aspect in a large sailboat!). You took it to extremes in weather broadcasting, and on the very channel I watched from its inception until 2006 when I emigrated. Very well done, and many thanks and congratulations. (Donation duly submitted). When I saw that photo, the first thing that came to mind was having to replace headlights often because they were at the bumper height of other cars and people couldn’t judge distances in parking lots. Mr. Gore is a Democrat… Therefore he would never be part of a scam to make lots of money while hyping up lies (Dying polar bears). OMG I inherited a Cromemco when I was a teenager. I wish I still had it, for the case alone – it was a beast. Had a hard drive with a smoked plastic case and you could see the platters turning. Anybody else remember the “Gold key” (PF2 key) and all the edit functions tied to the numeric keypad? I noticed on the video that the first “picture in picture” was of cows. Were they the first “weather cows”? The photo of the Z-2D brings back some different memories for me because of the MSU inventory sticker on the front of the box. I worked inventory for several years as a student and those tags were a great improvement over the ink stamps and lacquer finish that preceeded them. For any students out there, working inventory is a great way to get a behind the sceen look at some amazing science, especially if your school is in the middle of building a cyclotron. Anthony, you deserve to be incredibly proud of these devices that you designed, built, and maintained. And they are now a permanent part of history. Have fun in Atlanta, I look forward to hearing all about it! Gosh dang it, when Anthony has fun, it lights up the board. Also sent along a small donation. I also built my own first personal computers in the late 70s and early 80s. First one was based on a Signetics 2650 chip, which was a bit of an orphan at the time as there was not that much software around for it. Initially it used cassette audio tape for input/output, but I designed and built a floppy disk and later a hard disk interface for it. The next one was a cloned Apple II – there were several sources of bare motherboards and BIOS ROMs around for it, and the rest was just parts to acquire. So, I’m not the only one with a box or two of old parts, SWEARING I’ll build something useful out of them later? Seriously, very cool story, along with Willis’…somewhat different ones. Consider the tip jar hit! Great post Anthony. It brought back a ton of memories. TWC would have been nothing without the technology that allowed our computer satellite, radar, maps and all the rest to go in chroma key so the On Camera Meteorologists could point out the features and explain what was happening. I look forward to saying Thank You this weekend. One thing your post did not make clear is that this event is not an official Weather Chan nel event. I don’t even know if those who own and run the bussiness today give a wit about another year. This is a Reunion of the Pioneers on the occasion of the end of 30 years on the air. Over 80 of the 150 of us who took the Weather Channel from concept to reality are gathering in our senior years to remember this event which for most of us was the greatest accomplishment of our lives. That night of May 2nd, 1082 was certainly the biggest night of my life. And as for The Weather Channel today…. …..Your smart phone app makes for excellen competition. I always suspected you were a ‘Renaissance dude’! It is the myopic specialization of modern climate science that I find so terrifying. A broad perspective is an excellent plataform from which to view the Global Warming Scare. On the Warmist side no one takes an Interdiscipllnary approach…which is why their position is often an absurd hotch-potch of contradictions. I’ve got some science, some engineering and technology, some history and some media experience. From those multiple perspectives CAGW just never stacked up. Please remember: 63% of TV Mets are skeptical of CAGW. We would enjoy meeting other Skeptics like us at ICCC conventions. ICCC convention is in MAY. May is a ratings book. So we cannot attend…sigh. Unfortunately, it is the myopic concentration upon the need for govenment funds that fuels “The Science”; otherwise, I am total agreement with your sentiments. AGW is a lieing fraud, perpetrated by lieing fraudsters. The case against natural variation has never been made. The lieing fraudsters simply wave their arms in the air and that’s it. It’s called the NULL hypothesis, guys & gals. Disprove that the current weather & “climate” variation are “unnatural”. It’s remarkable to me that the early pioneer, TWC, survived through 30 years of broadcasting, and a series of revolutions in technology. Mr. Watts, thank you for the history lesson. I salute your old-school tech cred. You are most definitely the real deal. The world was lucky to have you then. We are still very lucky to have this beacon of yours, shining in the interwebs. I found the ad for Kodachrome film (RIP) during the Weather Channel’s first broadcast hour particularly poignant. You revived my old memory of 1978 when I worked for a small software house developing TRS-80 software. It was my Summer job between high school and college. One Summer afternoon in Lexington, MA, my TRS-80 was hit by lightning (true!) which blew up the monitor (the flyback transformer was a bubbling blob of slag), but the computer survived unscathed, and so did I. So, I had to rig an RF modulator to an old Zenith black-and-white TV rescued from the junkyard as a display. Pure analog. Not nearly as advanced as your project. Worked great, if you tuned the trimpots just right. Great post Anthony. It brought back a ton of memories. ……That night of May 2nd, 1082 was certainly the biggest night of my life. I’m sorry, but I’ve got to say it; “1082”? Does that mean that Mann was also invited since he was channeling trees back then? News from MSNBC?! WUWA?! I sent them a comment saying, “I’m not his wife. I don’t want ‘Wake Up With Al!'”. In the morning I turn it on and mute it. I unmute for “your weather on the 8s” at the bottom of the hour to tell when it’s time to leave for work. Thanks for what you’ve done. Not all of it is gone. May 2, 1982 was the same DAY I moved into the house I live in. I signed up for cable and caught that, evidently. Somehow it didn’t register that it was their first day moving in, too. Anthony, you not only are The Man, you Were the Man. Very impressive! Thanks for waking us through it. It’s scary that I actually understood about 25% of what you wrote. I made the mistake of visiting “feet2thefire”. Ye gods, Lucas electrics. My first car was a yellow Morris Minor convertable. In rain at night I dreaded stop signs and lights, because the car would die….UNLESS I could open my door and slam it shut fast enough. Then it would come right back! Old joke: Why do the Brits drink warm beer? Because Lucas makes their refrigerators. Have a great trip, Anthony. I kicked in a bit. Wasn’t enough, it’s never proportionate to the value that you give every day, but it’s something. Go and clink some glasses and talk old times with people who shared them. Donation done. Worth every cent. Your story takes me back to my days messing about with data acquisition circuitry. I made the mistake of selecting an S100 bus system and MP/M as the OS. The IBM PC was very new and I was getting conflicting advice from the “gurus”. Went on to become a fan of PC compatibles and bought my own NEC APC – brilliant technology for the times. Taught CAD and other stuff on it. Hope the weekend goes well Anthony. I have to run underground power 130m to my water pump – what a bore :-). Glad to make a donation, Anthony. Just wish it could be more. Have a great time! I too seem to be donating to SurfaceStations, which I am happy and honoured to do. It’s the only button I can see, so I hope it helps you on your trip. And remember, you can paint the town red. Painting weather screens white has already been done! What a nostalgic trip! Kept me up tonight. A tip of the hat to one great and deserving engineering, weather, climate, internet, etc. pioneer. Congratulations. And with so much to do yet….. Enjoy Atlanta and look forward to getting the scoop. That’s a very impressive bit of video circuit work. Brings back happy memories of the “good ol’ days” when you could actually see and work on electronics, before the whole lot disappeared into postage-stamp sized chips. I reckon you’ve earned that reunion ticket – have a good one. I’m still remember the day we un packed our Grass Galley 200 at the edit suite where I used to work in London. Two mix effect banks, loads of pattern wipes and a downstream keyer. Because the generation loss on 1 inch video tape was so noticeable as it was an analogue format the GVG200 meant that I could do really complicated video effects in a single pass without having to lose any quality. On one occasion I can recall using 14 play-in video machines and a dual channel Questech DVE into the GVG200 for a single effect! Of course I can pretty much achieve the same sort of thing on my iPad now. In the late seventies I was doing my apprenticeship and one of the things I learned was how to tune, set up and balance SU carbs most would be a doddle and others needed a bit more work, the worst were those spect for the US emitions regs which seemed to foul them up completely you could never get them to tune right till you had removed or disabled one or two of the “extras” then all was well. As for old tech my youngest son is desperate to get hold of my old Atari in its box in the loft. You should have used an Amiga — it did video natively! Congratulations on the invite. I’ve added some coins to the bucket. Enjoy hobnobbing with friends old and new. Thanks for the history. I never really understood video electronics, so I’m impressed. You brought back other memories: a Mini with a SU carburettor. My first computer was a Xitan S-100 kit system; all components had to be hand soldered. I had to make the keyboard, too. I could buy the keys, but the back contacts had to be individually connected and soldered. The video circuitry was an external hand made box with a few circuit boards in it, feeding a hacked black and white TV. Later a local magazine designed an S-100 video card, but there was no software driver! So I wrote that, which they published. Small donation made – have a good reunion. Donation made-enjoy a beer on us! This is an amazing technical history with phenomenal results. Congratulations, and have a great trip! Nothing wrong with SUs: the MG Midget still starts, still runs, still provides enormous fun when (if*…) spring comes. It’s 35 years old, 36 in November. It has none of the anti-pollution measures that gutted them for the California market. The sump fume rebreather, now, as a measure against the Kriegesmarine Effect, that I approve of. *Wx, not climate, very wet weather with a run of Atlantic lows powering in from the ocean and then sitting on top of East Anglia. I was at TWC launch in Vegas. I wrote the ads for the initial advertising campaign. Geat times, lots of fun, Coleman is a funny guy to be around. Ah! The trip down memory lane…..the IBM PC, Apple 2c, etc.! I have never been a meterologist, but have been in computers since the Apple 2c came out (actually longer – but those were big iron babies). Yep, definitely not ][c, that was the size of a big paperback book. Too many good old day moments to comment on, so I’ll just note that I was a cofounder of a company to produce a music sightreading teaching program for Apple and later Commodore 64. Midi keyboards came out in the middle of the project, so that was a big help. When I bought the Apple ][+ I used for it I spent some time studying the circuitry for the NTSC signal and floppy disk interface. Woz did an amazingly good job at pushing the hardware well beyond its capabilities. For his market it was great. I imagine TV techs were appalled at his abuse of the NTSC spec. My development “network” consisted of a Heathkit H89 computer with a Corvus 10 MB hard disk running C/PM, connected to the Apple which used a C compiler with its own command “shell”. I could run a script there that would pull over source code from the C/PM over a serial line, compile it, delete the source (not enough space on the dual floppy system), and go on to the next file. I could tell it to compile 3 or 4 files, then go get lunch or have a shower. When I added the C64 to the mix I used MIDI to link it with the Apple, and wrote a C64 program to load the music program from the Apple (they both used 6502 series CPUs) and also provide hooks to my debugger that ran on the C/PM side. We don’t build networks like that any more! I still have the ’67 MGB that has been in the family since 1968. No need to apologise, OldOne. The British motor industry had its peculiarities, but nice to hear about your MGs. I was born near Abingdon where they were made, and my grandad had a Magnette, which was a sort of poor mans Jag. Very beautiful.. Now my niece’s boyfriend works on the new mini, and its owned by BMW, so teutonic quality control rules. As for the beer, I accept no advice on how to make or serve that from Americans, thank you! Our bitter is neither ice cold nor warm, but cool! Enjoyed the video and seeing “old friends” from watching the Weather Channel back in the good ole days! Congratulations Anthony! People don’t realize the hundreds of unsung heroes, who engineer something new and make the world a better place. Interesting about the NEC 7220 chip. HP was trying to get out its 811132-bit CPU, I think we slayed the production problems by mid-83. Within a year, HP built four or five custom graphics boxes for Disney with that chip, allowing for the first real-time generation of 3-D computer graphics. The first image for demo was a chrome-plated drive shaft, rotating, with all the reflections. Those boxes allowed for computer-generated cartoons. Wow! What a wonderful review of technology. Sir Andrew, I know you have zero (or less) free time but I’d sure recommend glancing thru “Analog Circuit Design, Art, Science and Personalities” Jim Williams, Editor published by Butterworth Henieimann. The book’s cover picture says it all. On the SU’s many problems, I found that replacing the throttle bushings fixed the air leaks that caused most tuning problems. I believe that came out of a book called “Jaguar Cars” by a C L Van Dienst. You really are a most talented individual. You have added much of quality to my world. As the OCM (On-Camera Meteorologist) who did the 2nd half hour of TWC’s first day (the guy on the first frame of the Youtube video is Bruce Edwards, who went on to work in Cleveland for many years), I wish you the best on your trip to Atlanta. I will not be able to attend because I am recovering from surgery earlier this week, and I will miss re-living all the crazy things that happened as we worked together to make John Coleman’s dream a reality…thank you, John, for giving me the chance to be part of it all. 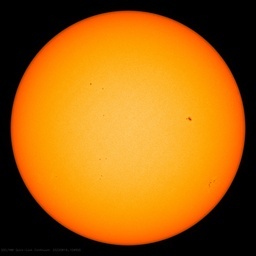 The current network is disgraceful, not only in terms of their misguided stance on AGW, but also in terms of the lack of independent thought and meteorological content in the presentations. It has become a parade of babbling “haircuts” and “cupcakes”, with precious little knowledge passed along to the viewers. I can’t argue with the success of the current business model, but it sure isn’t what we set out to create 30 years ago. Have a great time! One Summer afternoon in Lexington, MA, my TRS-80 was hit by lightning (true!) which blew up the monitor (the flyback transformer was a bubbling blob of slag), but the computer survived unscathed, and so did I. Your computer may have been saved by one appalling design choice. The monitor had an unpolarized plug, and one line went right onto the chassis, IIRC. All the plastic around it made it safe enough. I’m not sure why I figured that out. I did realise that the video link between computer and display included an opto-isolator, which struck me as rather odd. That may have inspired me to look more closely at the monitor or perhaps I was tempted to look at the video stream on my oscilloscope or something. No, the oscilloscope was later. At any rate, there’s about a 95% chance that opto-isolator video connection kept the voltage spike in the monitor and out of the computer. Your point is (un)clear; bass-ackwards, actually. The NULL is that current weather & “climate” variation are natural. So demanding skeptics ‘disprove it’s unnatural’ is the Trenberth Twist. And govenment should be either government or gubmint; your choice! Back in the 70s I also had a ’68 MGC roadster, but unfortunately I sold it. Yes, the beer is served cool. My favorite beer the year I was in London was Guinness stout on draught. The bartenders would put a script G in the head, which would remain all the way down to empty. And in Bedfordshire, which is not really EA. Over 4 inches of rain in April (so far) and they keep telling us we are in a drought! It’s good to hear from John Coleman also. The early weather channel was a pilot’s dream. I was a corporate pilot at the time and a visit to The Weather Channel was better than a call, or visit, to the local Flight Service Station. Now, it’s mostly fluff. Those were good days. Thank you John; thank you Anthony. All those photos of chips and cards and you have failed to note the father of computer science, Alan Turing, in your communications time-line Anthony!